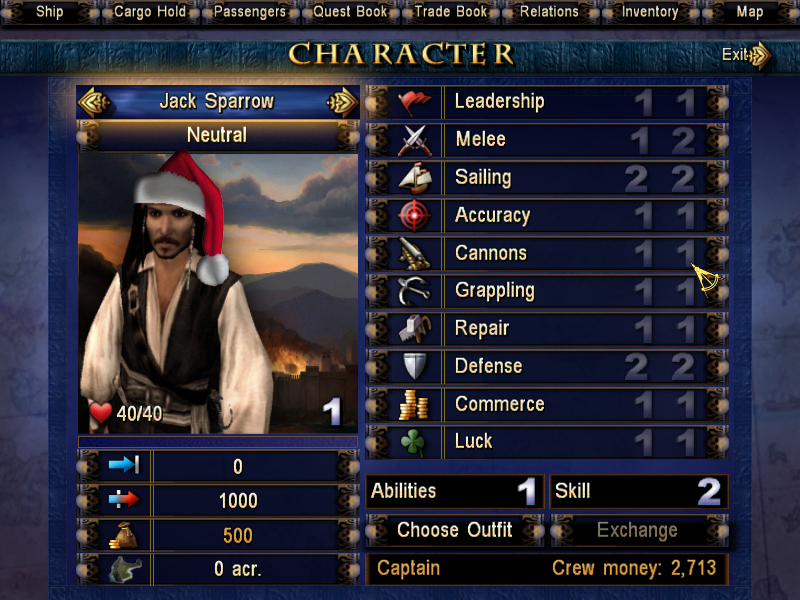 Pirates of the Caribbean is a very nice pirate Role Playing Game for PC. Although the game was far from great, it was certainly good fun, apart from the bugs. Fortunately for the players, the game could easily be modified and that is how the Build modpack began. The Build contained all good mods joined into one package for easy installation. I started messing around with modding after Build 12 was released. I made a couple of small mods myself and added all mods that other people made into what soon became a major add-on for Build 12. Finally, two years after the release of Build 12, this modpack has been released as Build 13, introducing many new bugfixes, features, mods, character models, locations, items and yet again enhancing the game quite a lot. Build 13 Final is the final full installation version for Build 13. Work is in progress on Build 14, for which several Alpha versions are available for public testing here. Please note that these versions are not completely stable and contain several bugs, ranging from not so bad to gamekilling. Build 13 is recommended for those who just want to play the game. Only get the Build 14 Alpha versions when you want to work as an alpha tester for the modding team. Please ensure that you back up your base install of PotC as re-installing the game takes longer and is not necessary. It is also a good idea to back up for each build as the update process has been known to go wrong in cases. PROGRAMMERS, TEXTURE ARTISTS AND MODELERS WANTED FOR BUILD 14! Go to the PiratesAhoy! 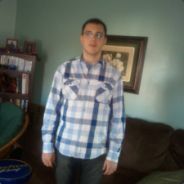 forums and show us what you've got! 6) Start a new game and ENJOY! Pirates of the Caribbean is a trademark of Disney. The Pirates of the Caribbean video game franchise is a trademark of Bethesda Softworks, ZeniMax Media Corporation and Disney Interactive. Neither Disney or Bethesda Softworks are involved with the production of this Modification. Merry Christmas: Especially for Us! In 2003, the game "Pirates of the Caribbean" made by the Russian game studio Akella, was released to the public. Being the hyjacked Sea Dogs 2 in disguise, the game was a rush-job with a lot of potential that went untapped in the original game. However, this was soon to change with the PiratesAhoy! Build Mod series! "Pirates of the Caribbean: New Horizons", also known as "PiratesAhoy! Community Build 14" has been worked on non-stop ever since the release of the original game. What we have been able to accomplish blows all our expectations out of the water. 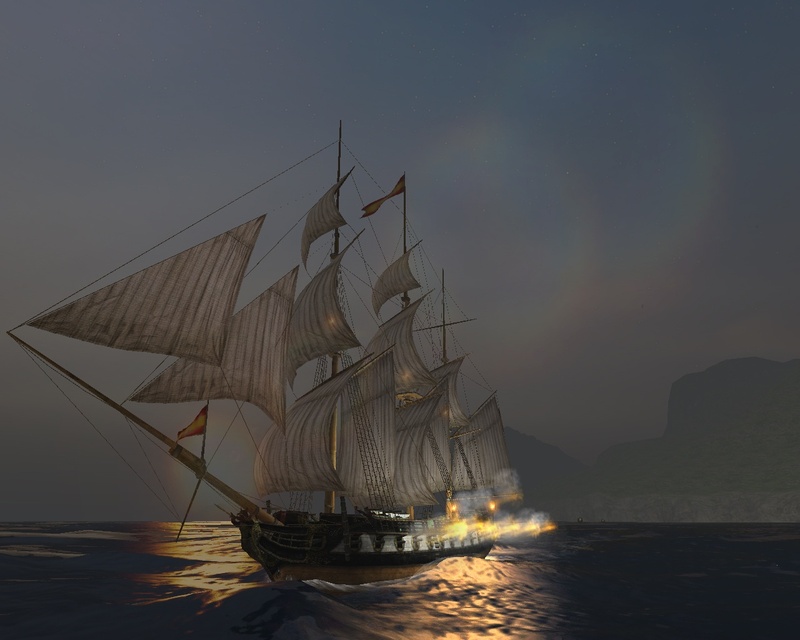 We have added more features, some of which were thought to be impossible to achieve due to game engine limitations, most notably the DirectSail and Different Flags mods. There is vastly more historical realism, with different time settings being available within the same game. And there is much more story as well, with various storylines being available with different characters, new scenes and events and different gameplay. Not to mention somewhat improved graphics, along with new textures and models. Big News: We're Getting the Source Code! Game engine limitations will soon be a thing of the past. We have been able to contact the original game developers, who have graciously provided us with their set of modding tools and will soon give us access to the source code of Age of Pirates II: City of Abandoned ships. This game is based on an updated version of the PotC game engine, though is newer and, amongst others, has better graphics. Lack of availability is one of the main problems we have been experiencing in getting people interested in our PotC Build Mod work. For now, Age of Pirates II: City of Abandoned ships has been released in many parts of the world, but is also rather hard to find because of less-than-stellar publishing. Soon the game will be made available for digital purchase from Gamers Gate though, which will ensure that availability problems will also be a thing of the past. For now, we are still working on Build 14. More bugs are being fixed and we have some major projects in the works that are required to be finished before the final release. Amongst others, this includes the creation of a comprehensive, yet entertaining and educative Game Manual in our "Seafaring fantasies" project. A big part of our Manual, which will remain a Work In Progress for a while to come, can be read here on the ModDB. It is written in the shape of a story, which makes it a worthwhile read even for people with only a passing interest in our modding efforts or the Age of Sail in general. We have also gotten started on the "Willemstad Builders' Trials" seakeeping project, which is intended to improve the manoeuvring characteristics of all ships in the game. No longer will ships respond as if they are on rails. And no longer will there be uber-ships. Battles will no longer be won based on firepower, but also on clever manoeuvring and making use of your ship's advantages. A sample document and code files can be found here on the ModDB. Getting access to the games' source code is incredible news with huge implications. This could be the beginning of a whole new era in pirate game modding and development. We could create renewed interest in the Age of Sail and get people who otherwise like only fast-paced arcadey games to appreciate the subtleties of historical realism and slower and more thoughtful gameplay. We could combine the best aspects of all previous Storm-engine based games into one game and expand on them based on our own ideas and preferences as well, taking into account the "modern gaming audience". If we play things right, this could become a truly amazing project. More amazing than it already is. To join different people from all over the world with different languages and cultures together on a common project and work together in a democratic and supportive way without caring about race, age or religion would be an incredible thing. Not just from a gaming perspective but also as a view of what this world could be. We have plenty of plans and this will require plenty of people to make them into a reality. More than we currently have. Maybe you have plenty of ideas yourself as well. 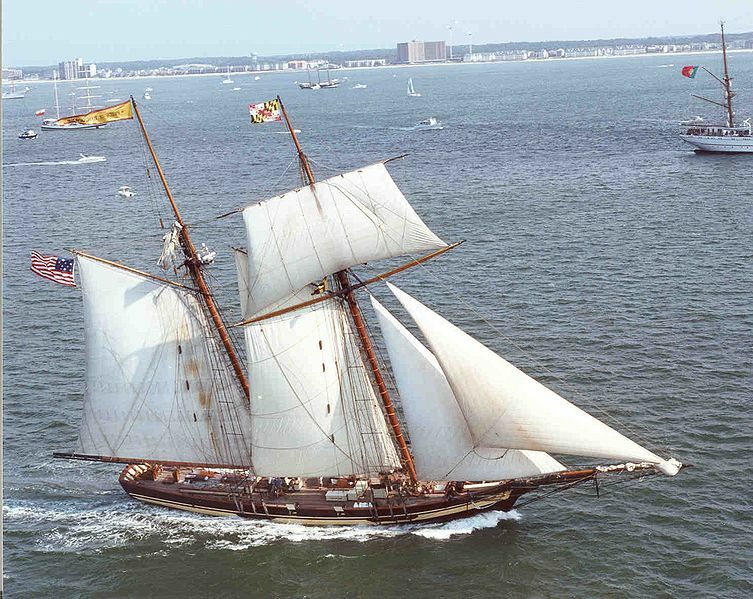 So if you have any care at all about making a game set in the historical Age of Sail, be sure to join us on the PiratesAhoy! Forums! The possibilities are endless. Maybe we could expand these games to include not only the Caribbean, but other parts of the world as well. Maybe eventually we could even provide Massive Multiplayer Online (MMO) gameplay. There has been a precedent of that in Voyage Century Online, which is based also on the Storm engine, same as Pirates of the Caribbean and both Age of Pirates games. If YOU help us, the sky is the limit! Methaphorically speaking. Even if we can live up only to a fraction of the possibilities, we will have gained more than just a better game. As such, I wish us and everybody who joins us all the best for the future! So a VERY MERRY CHRISTMAS to you all!!! From now on, all news, media and downloads for Build 14 will be posted on it's own all-new profile. Be sure to add the new profile to your Watch List! This is a short but fun advert made by PiratesAhoy! member "Captain Winter". Contains the Midnight Full Cargo Hold CTD fix, DirectSail Mod and a Fight Fix. Refer to to the "buildinfo" subfolder for additional details. why i cant play ? was closed? Essentially, as a PC novice, running Windows 7, how much cursing and crying will it take for me to run this absolute beaut of a game? It runs just fine for me on win 7 and win 8. The only thing to be concerned about is that if you install it into program files windoze security will stop it from running. Build 13 development stopped years ago and and the current version is Build 14. It can be found here.